The top of the range, 16 Channel X8R receiver from FrSky with 8 normal PWM outputs and no less than 16 channels on the dedicated S.BUS output, plus the exciting new Smart Port. The X8R is a surprisingly compact package compared to many 8 channel receivers and has all of the amazing functionality associated with FrSky products. The Smart Port supports the new hub-less sensors in addition to the older hub analog sensors. 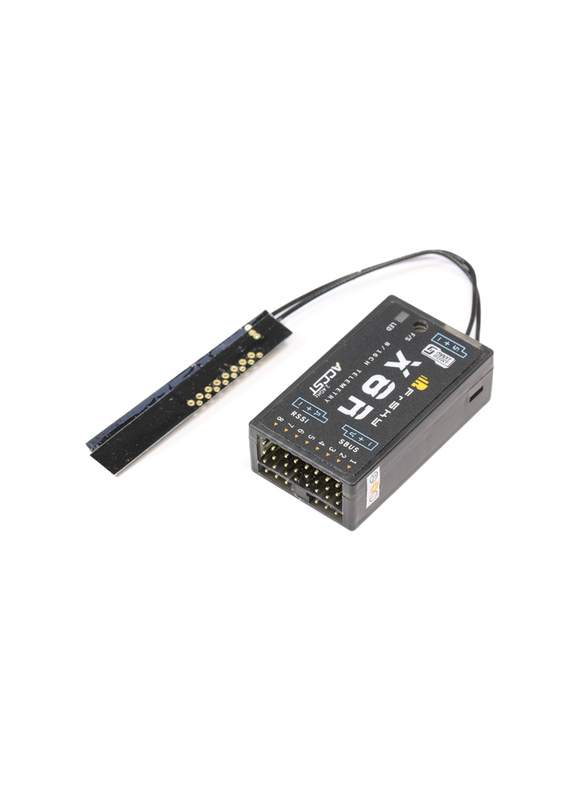 The X8R supports 8 standard servo outputs, with a further 8 being available by using the S.Bus line with S.Bus supported servos or use a FrSky S.Bus Decoder, giving you a total of 16 channels. Alternatively, you can use two X8R receivers in combination and the channels will sync 1-8 on the first and 9-16 on the second. The second option will give a fantastic degree of redundancy, essential when flying large models and highly desirable in any event. The X8 protocol is backward compatible, so that in D8 mode it works with the DHT, DJT, DFT and DHT-U transmitter modules. This mode you facilitate a total of 8 channels and all of the Smart Port functions so that you can still use the full range of digital sensors. The PCB antenna has been recorded as providing up to a 20% gain in range over traditional and to save weight, these antennas do not have an external case. This is an outstanding receiver for all applications and is perfect for use with the FrSky Horus, X9D and X9E Taranis transmitters, with their built-in XJT Module or any of the D8 systems to take advantage of the new digital Smart Port sensors. Expand the X8R with four more PWM channels using the FrSky SBUS to PWM Decoder. Firmware: There are two options EU LBT and Rest of the World, select as required. NEW: RX8R Pro - The new Pro version of the original X8R now supports FrSky's redundancy function; this means you can add another receiver to create a back-up in case one fails.